Rust is a German village of less than 4000 inhabitants, in Baden-Württemberg. Every year, in this small town on the border with France, over 4 million people flock to Europa-Park, the second largest amusement park in Europe after Disneyland Paris. Europa-Park was founded in 1975 by the Mack family, who are a leader amusement ride manufacturing company in the world. Of course, the comparison with the amusement park in Paris is totally out of proportion: in 2012, Disneyland Paris has been visited by over 15 million people. However, also the price of the ticket is not comparable: a one-day ticket to Disneyland Paris costs € 62, while you spend € 39 to access Europa-Park. Moreover, Rust amusement park stands out in Europe’s panorama for its excellent range of attractions, over a hundred, some of which are unique to the continent. Until 2012, for example, the park boasted the Old Continent’s tallest roller coaster, named Silver Star, which today is surpassed only by Port Aventura’s Shambhala in Salou, Spain. Silver Star is up to 73 meters high, and has a top speed of 134 km / h.
Before telling you about the attractions and themed areas, we would like to provide some useful advice for those who want to plan a visit to Europa-Park. The first one is surely to avoid going on public holidays: these include Easter, the month of May in the days near Mother’s Day and Pentecost, October 3 – German Unity Day, and October 31, which is Halloween day. Another useful tip regards your access to attractions. In the first few hours that the park is open, it may be convenient to get to the rides that are located away from the entrance, which are easily accessible via the monorail train, less busy in turn. In the morning, you’ll spend less time waiting in queues at the water rides, while the most insane, high-adrenalin attractions are more easily accessible at lunchtime. Moreover, when you enter the park, take a look at the show schedules too, so you can better plan your day of fun. One final suggestion: this amusement park is so huge that one day is never enough to get into all the rides. So what is best is to book a room at one of the hotels in Rust, in order to enjoy Europa-Park for at least two consecutive days. Also because many entertaining shows, with multicolored lights and, very often, lively fireworks usually take place at dusk and early evening. The 2-day ticket to Europa-Park costs €73. This amusement park in Germany covers an area of over 900,000 square meters and features hundreds of attractions as well as 13 large European country- themed areas. It may be impossible to mention all the attractions of Europa-Park, so we’ll focus on a few very important ones. Wodan Timburcoaster is the new big attraction of the park, which intertwines with the other roller coasters in a phantasmagoric tangle: it’s top speed is 100 km / h. The “Universe of Energy/Dinosaur Ride” sends you back to the heyday of the Jurassic era, amid large prehistoric monsters. Eurosat is a roller coaster for the whole family. On the Swiss Bob Run you descend at full speed on a wheel-bob, while the Matterhorn Blitz is a roller coaster with 180-degree curves. Fjord Rafting is a rapid ride through a mountain torrent, while in the Ghost Castle you will be terrified by ghosts and horror characters. The Alpine Coaster Enzian is always a roller coaster, but set in the Alps, while the Tirol Log Flume is a very classic route on logs floating on the water. If you choose the aquatic ride Poseidon, instead, you will travel on special boats and enjoy steep drop-offs. Cassandra’s Curse will cause you a terrible sense of disorientation, while the brand new Blue Fire, a launch coaster, goes up to 37 meters in height, has a top speed of 100 km / h, and a gravitational pull of 3.8g. Finally, Whale Adventures – Splash Tours, suitable for the whole family, is a wonderful ride on a 8-passenger boat, an adventure that will leave you speechless… and very ‘wet’. Europa-Park themed areas are very interesting too, and are dedicated to different European countries. The terminus of the monorail that runs through the park is found in the Germany country-area, where also the Silver Star is located. The area dedicated to Italy offers performances that reproduce the ‘Carnival of Venice’. In the Dutch country-area there are rides dedicated to Peter Pan and the Pirates. In Scandinavia you get on a big pirate galleon, while the area devoted to Russia features Euro-Mir, a spinning coaster that resembles a space station. One of the most popular attractions in the space dedicated to Austria are high-adrenalin rides on awesome roller coasters, while in the Spain area there are many shops and horsemen shows. “In France” you will enjoy the indoor roller coaster Eurosat and a 4D cinema with special effects, while “in Greece,” you can watch a delicious ice show. If you visit the England area, don’t miss a ride on the classic London Bus or on the original Football Scooter bumper. The most beautiful children’s attractions are in the area dedicated to Portugal, while in Iceland you can have fun on the launch coaster Blue Fire and with the ship battles on water. 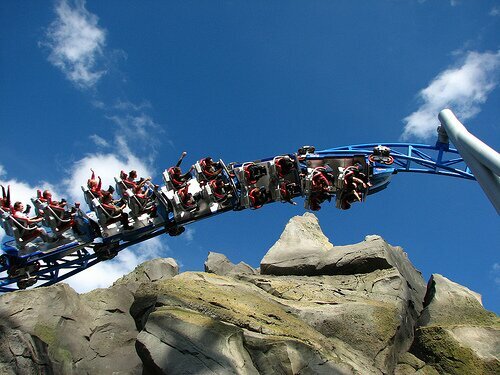 During 2013 Europa-Park is open daily from 9am to 6pm, from March 23 to November 3. This entry was posted in Family & Kids..